If you go down to the woods today, Little Bulb have a big surprise. Set on the last day of autumn as winter creeps ever closer, the company is bringing the wildlife of the forest to the heart of the city in a series of charming sketches. Following 2013’s Antarctica, they once again take intrepid young explorers on a charming, idiosyncratic tour of the animal world. 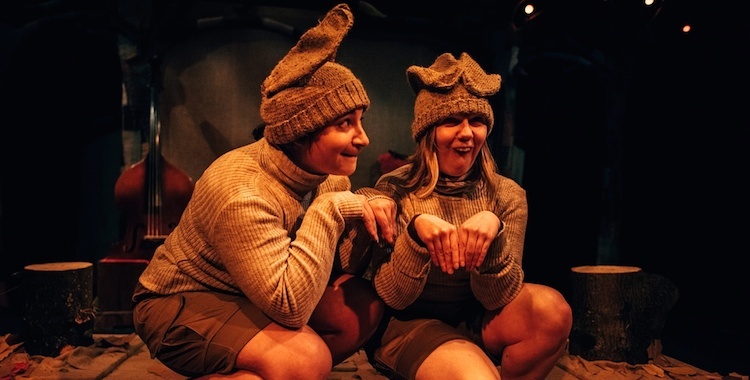 With trademark Little Bulb energy, performers Clare Beresford, Dominic Conway and Miriam Gould rapidly transform from excitable woodland wardens into the various animals they conscientiously watch over. Hyperactive squirrels, a sly but suave fox and a hungry, shortsighted owl all make memorable appearances, evoked by homespun, makeshift costumes. That’s without even mentioning the rare, much-anticipated winter unicorn. They have their audience of under-sevens sussed, getting them noisily involved one moment before holding them quietly rapt the next. The key is in variety and ingenuity, as their motley cast of creatures – from rabbits to badgers to frogs – constantly changes. And the music – central, as ever, to the company’s work – ensures that this is no ordinary woodland. Brandishing banjos and violins, Little Bulb’s endearingly goofy rock stars turn forest into gig, while kids excitedly clap along. The multitalented trio swap instruments as readily as costumes, deftly matching musical genre to animal. As with all of Little Bulb’s work, the DIY aesthetic belies the craft and detail of a show that considers parents as much as kids. There are plenty of grinning asides for the grownups, along with some entertainingly wry, mock-David Attenborough commentary. But really the joy lies in the silliness and wonder, both of which Little Bulb offer in bumper Christmas-size portions.